For those that sent us suggestions, many of which are in this release: THANK YOU! For those that haven’t sent their great ideas in—please take a moment and send me your thoughts on what we should fix or work on next (panos@zenqms.com). Either way, keep the ideas coming! Document revisions usually require more than one set of eyes. 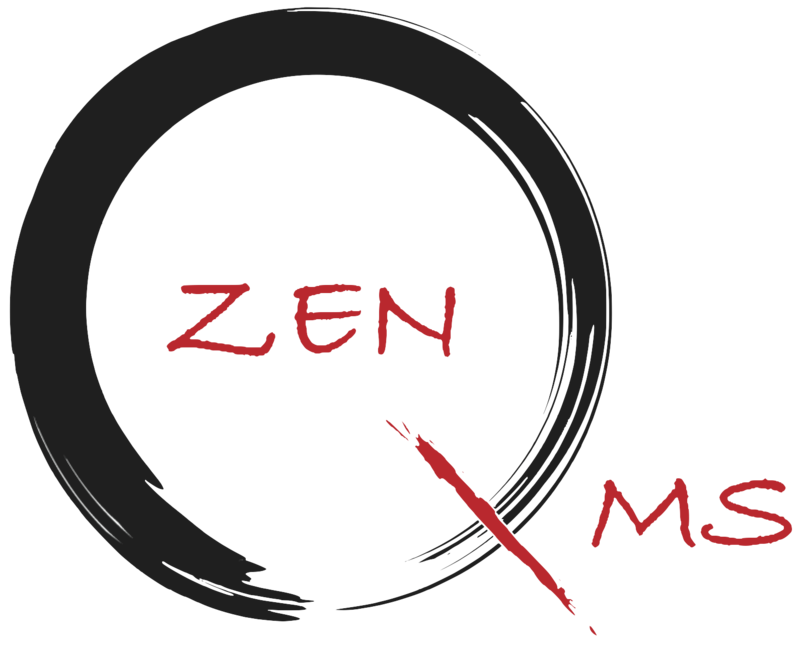 ZenQMS previously entered finalized documents for final approval and lifecycle management. But now users can manage and document the drafting process directly in ZenQMS. Revisions: Now every controlled document can have unlimited draft revisions before it is published. Simply click the Upload Revision button to add one. All past revisions are easily accessible and can be compared later. All review and approval workflows rely on the FINAL version—all draft revisions are deleted on final approval. Revision Comparison: Want to see what changes your colleague made in version 3 versus revision 1? The revision window allows users to compare two files. Simply select two versions and click ‘Compare Selected Documents’. This works best with MSWord and PDF documents, but also supports other file types. Try it! Draft Review: We have added the ability to launch a draft review workflow. This is a less formal workflow that creates a linear review process that any user in the company can participate in. Reviewers don’t need any special privileges to be able to respond to the workflow, download and edit the file and then upload their revision with comments. Users can leave ‘track changes’ on the document or use the document comparison tool discussed below. Draft: All documents start here. Only authors and users with special permission can see these documents. Draft Review: Documents with an active draft review workflow. 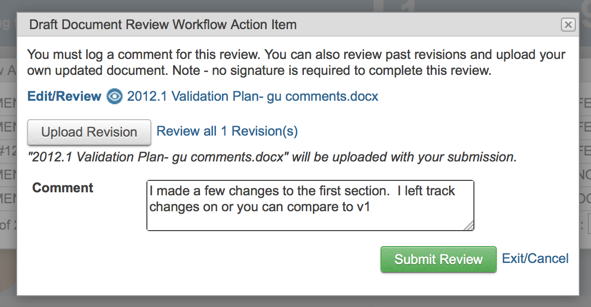 Reviewed: Designates documents that have completed part or all of a draft review workflow. Awaiting Approval: Final Approval workflow is active. Rejected: Temporary state triggered by a workflow rejection. Approved: Document completed approval workflow. Effective: Document effective date has been reached. Flagged for Retirement: After a review has been completed, document has a new draft in process. Retired: document is retired and only visible to authors and users with archive access. Document Tabs: The Documents window was getting crowded, so we created a permanent header and organized all activity into simple tabs. You can launch workflows from any tab. No changes to other legacy functionality. Custom Fields: all document custom fields are now linked directly to document versions, meaning that the values can change from version to version. Auto Link Carryover: Document links will be copied over to new draft versions automatically. They can be deleted if no longer relevant. A great use case is SOPs linked to many forms. Workflow Users: Ever wanted to see who is holding up all the documents with active workflows? You can do this quickly now by adding the Workflow Users column to the table. Managing Effective Dates: We have created a little more flexibility with effective dates as described below. You can now publish a document with an effective date in the past. This was an important exception to allow users to upload old documents manually. Super Admins now have the ability to alter effective dates for any non-retired documents. Obviously this is an important and restricted permission. All changes are logged in the comments / audit trail. And will have an effect on assigned user training records. Allow Document Category editors the ability to hide/show user date/time stamp on exported documents. Coupled with a blank Watermark text, this improvement effectively allows users to download documents with no watermark text at all—ideal for controlled forms. Harmonized footers with simplified format that includes UTC timestamp to avoid ambiguity. Enhanced Keyword Search: keyword searching is faster and includes more data. Rejected Workflows: Authors will get an immediate email notification when a workflow step is rejected, including the reviewer’s rejection comment. The document remains in a Rejected state until the Author changes it. A long time coming, these initial changes in the login and password recovery process are based on bottlenecks and areas of confusion we have documented for new or existing users. We managed to take waste out of the process and enhance security at the same time. Larger text/icons for easier use on mobile. Forgotten password process initially only requires valid email address and captcha clearance. Emails go out to valid users only, and will include password reset URL links instead of written jumble of letters. These links expire. Logging in will require security challenge or 2FA validation. Password reset screen takes all the guess work out. For those who desire higher security than simple password protection, users and administrators can now take advantage of 2-factor authentication using their mobile phones. Simply navigate to Administration/mySettings/Security and to turn this on. And administrators can require 2-factor for all users. The changes here were subtle but very important, for both starting up and managing your account. Add Users Without Invitations: This feature makes it so much easier to get started. Add all your users to the account without triggering any emails that may confuse your rollout. Users can get configured, assigned to groups and training and be invited later using the ‘Send Invite’ button. Clearer User Status: The new user status designations make it easier to know when a user has been intentionally locked out versus disabled due to too many failed log in attempts. Uninvited: User has not been invited, does not have a password and cannot use the password recovery process. The value of this status is to configure the account, user groups and training assignments and to migrate training records. Active: User is invited and able to access the system or use the password recovery process. Locked Out: User has been locked out due to too many failed log in attempts. User will require administrator intervention to get back in. Disabled: An administrator has locked the user out. They will receive no emails and cannot log in without administrator intervention. Groups Column: Shows a comma separated list of all groups a user is assigned to. 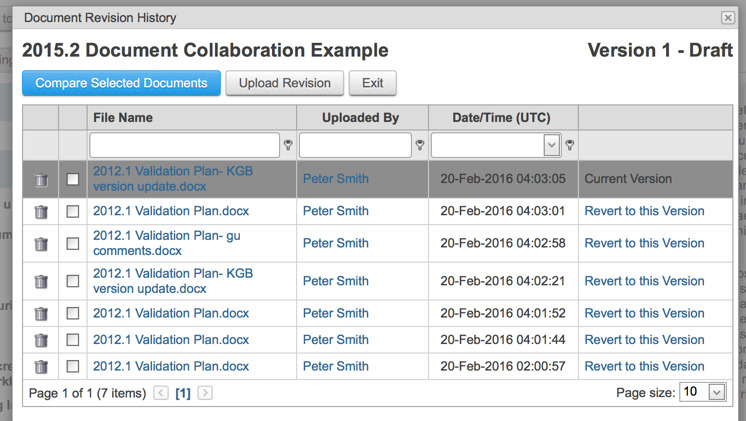 Data Migration: Include user title, site and supervisor as part of your mass uploads now. ZenQMS has had zero unplanned downtime in the last 3 years and maintains > 99.99% since we launched the production platform in 2012. Despite this, we understand the need clients feel for wanting local access to a copy of their data. For instance, some may want local access to their SOPs or all issues. It’s a basic requirement from a business continuity perspective in a GxP environment. So we did something about it. Clients on a premium service plan can enable Account Backup with a single click and choose their preferred frequency. Your designated contact will be notified when the newest backup has been created. They can then log in and download a zip file directly to their local host. The zip file will contain PDF copies of all items in their accounts: Documents (Effective and Retired versions), Issue, CAPAs, Audits, Tests & User Training Dossiers. The application will also download individual MS Excel files that show all the relevant table data for each category (e.g. all table data from Controlled Files page) including all fields and custom fields. All items will be organized in a simple folder structure. Many of our clients have implemented heavily configured systems for ERP, lab or operations management. And our new API makes it dead simple to extract data from our application into another local system in a secure way. We have introduced a ‘REST API’. Below is a screen shot of the settings in Member Account page. Nothing special here, but we have simplified and slightly re-organized these pages. Draft: New issues are set to Draft. Awaiting approval: Investigator has launched workflow approval for implementation. Implementation: Will remain in this state until all CAPAs are completed. When this happens, or if no CAPAs, go to FINAL REVIEW. Final Review: This state is automatically set when all CAPAs are completed. During this phase the Final Review step(s) are launched. Closed: This state is automatically set when all Final Review steps completed. Awaiting Effectiveness Check: Automatically set if any EC steps are active or incomplete. Effective: when all EC steps completed. Failed: if an EC step is rejected. Disabled Users View: Previously disabled users didn’t appear in the training tables anywhere. Now users with special permission can simply select Disabled Users from the Training tab to see all disabled users and their dossiers. Accessing User Dossiers: There were some inconsistencies in accessing user dossiers from certain views. These changes fix that. 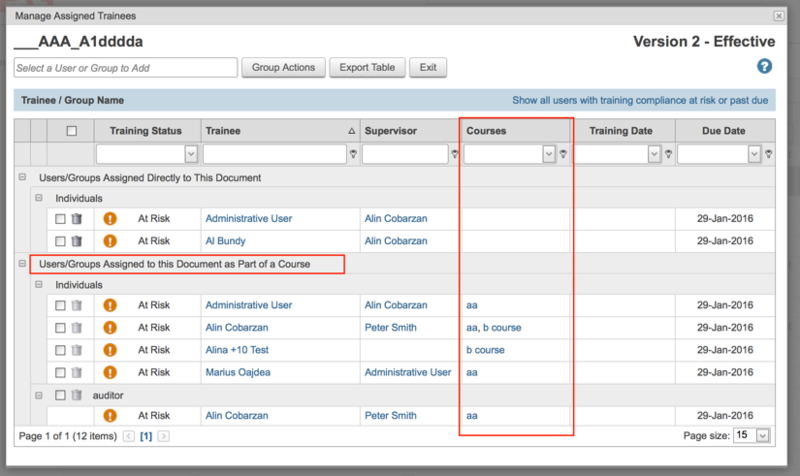 ‘Trainee Records’ in all views except Groups, users can access a dossier by clicking on the selected user’s training status. Courses – Manage Assigned Trainees window: this window now includes a Dossier link for any assigned users. Dossier – ‘Currently Assigned’ View: This is an important update to the dossier. Now users can easily see only documents that they are currently assigned to and their status on those documents. The other views remain in tact—so users can see their entire history for completed trainings and current at-risk/past due assignments. Dossier columns can now sort all data. Document – Manage Assigned Trainees Window & Course Assignments: We have integrated course assignment data into a document’s Manage Assigned Trainees window. So users with access to the training window can quickly see HOW someone is assigned to a document from a single place whether it was directly through the document or through multiple related courses. This clears up some confusion around courses, which are the primary means for enforcing a training matrix. Daily Summary Email: Changed ‘At Risk’ color in daily summary email to be more orange and not yellow (I mean can anyone read that?). Rejection Emails: Authors/Investigators/Auditors/etc. will now get an immediate email if a workflow step on their item has been rejected, including the rejection comment. Required Fields in Forms: Most forms now indicate required fields with a red asterisk (*) in addition to firing validation flags. New Custom Fields: On popular demand, we have added two new custom field types throughout the application. URL: Users with edit rights see the full text and a ‘Test Link’ that opens the link in a new browser window. Non-editors only see a hyperlink. This is a great way to link to external items (e.g. an ERP or LIMS view). Multi-Select: The most ideal way to add a lot of data in a single field. All checked items appear in the tables in a comma separated list, so they can be used for filtering. Emails: We have changed our default formats to include user name and/or email ID in email bodies, something that helps if users are in multiple accounts. That Thing That Drove Everyone Nuts: We fixed the ‘feature’ in workflow launch pages/windows that would lose step names/selections when you clicked to add another step or select authorized step users. Enhanced Keyword Search: keyword search in the application continues to get better and faster.